Water damage can result from numerous events such as sudden rainfall, large amounts of snow melting, a hurricane, tsunami, or a plumbing issue. Flood waters are extremely dangerous and can pose other problems such as mold growth that can be harmful to one's health if the damage is not taken care of properly. Here are the top 12 ways to reduce water damage to your home or business. Before entering the flooded area, make certain that the power has been turned off in that part of the building. Contact your agent or insurer and give notice of the loss and damage. Your insurance company usually can provide the names of contractors who can provide emergency services and help with mold prevention. Follow the insurance company’s directives regarding emergency repairs and mitigation. Remove water by mopping and blotting. 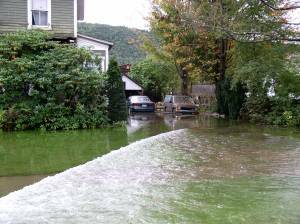 If the damage is significant, consider using a water extraction company for immediate help. Wipe furniture dry. Whenever possible, move wet items to a dry, well-ventilated area. Stand up wet furniture cushions for drying and place small pieces of wood or aluminum foil under furniture legs. Increase air circulation by opening closet and cabinet doors, moving furniture away from walls and running fans and dehumidifiers. 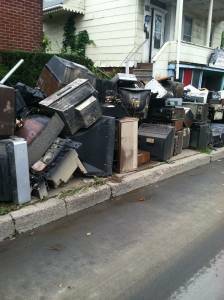 Don’t discard damaged items without approval of the insurance company. Keep an accurate record of all repairs and expenses, including receipts. Using an ordinary household vacuum cleaner to remove water, or using electrical appliances while on wet floors. Entering rooms with standing water if the electricity is still on or where ceilings are sagging from retained water, as they could collapse. Adjusting Today - "Flood: Understanding and Recovering from One of Nature's Worst Disasters"
Disaster Recovery Today - "Water Damage: Mold & Salt Water Inundation"